Start a task on a specific day of a week only!! There has been scenarios where my client want to start a task on a specific day, like Sign Off of each Sprint need to be sent on specific days only. You need to have a specific Calendar created for this, which would make that specific day as working only. Say Sign Off request to be sent to Clients on each Monday. Now I need Sign Off(s) to be sent only on Monday(s), so I insert a task before it and apply specific calendar on it and link Sign Offs to it so as to make Sign Off start on Monday(s) only. 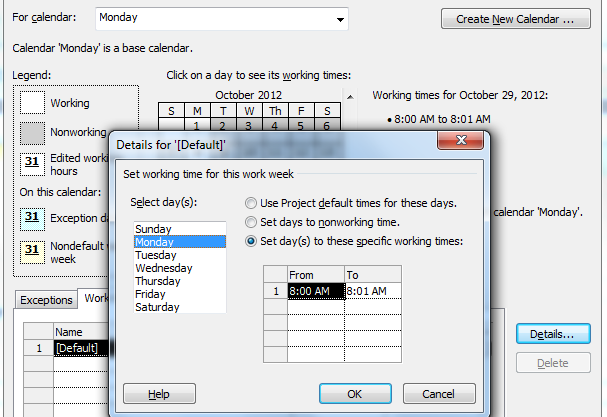 Firstly, create a Calendar making Monday as working for 1 minute and set rest of the days as non-working. Now I added a dummy task of 1 min duration before this Sign off task and linked it to this dummy. Now applied this task calendar to dummy task which would make it working each Monday only, hence Sign Off would always start on Monday only. Now you can see that Sign Off mail task will always start on Monday. This is a work around to make a task start on specific day without using any hard constrain – which would in-turn hinder the project’s flexibility and is susceptible to changes when re-shuffling of tasks and dates happen.